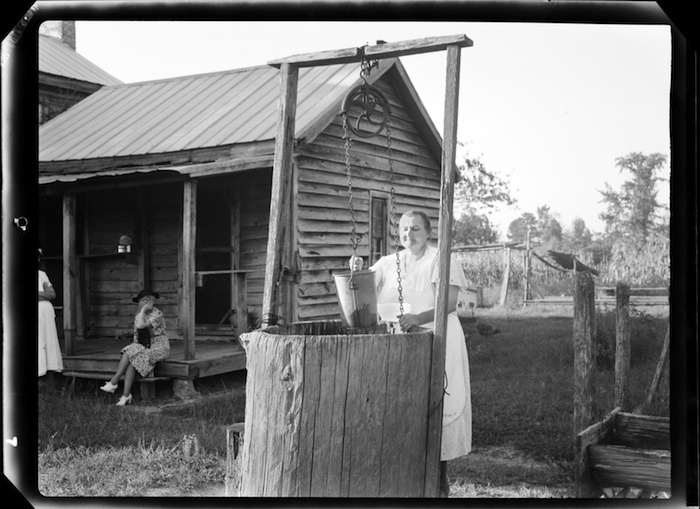 Reference print from images created for Folk Plays of Eastern Carolina: Woman drawing water from a well, in the Charles Anderson Farrell Photographic Collection (P0024), North Carolina Collection Photographic Archives, University of North Carolina at Chapel Hill. Abstract In 1923, Charles Anderson Farrell, a native of Yadkin County, N.C., became the first professional photographer for the Greensboro Daily News in Greensboro, N.C. In addition to his work for the newspaper, Farrell operated a photography studio, camera store, and art supply shop in downtown Greensboro. Farrell contributed photographs to several University of North Carolina Press books. The collection includes 688 photographic images (photographic negatives and prints) related to three books published by University of North Carolina Press that Farrell worked on as a photographer: Stella Gentry Sharpe's Tobe (1939), about a young African American boy and his family; Bernice Kelly Harris's Dramatis Personae: Photographic Studies: Eastern Carolina Folk Plays (1940), and Aubrey Lee Brook's Walter Clark: Fighting Judge (1944), about Clark, who served as chief justice of the North Carolina Supreme Court, 1903-1924. Creator Farrell, Charles Anderson, 1894-1977. For copyright and use restrictions contact the North Carolina Collection Photographic Archives, University of North Carolina at Chapel Hill. Copyright is retained by the authors of items in these materials, or their descendants, as stipulated by United States copyright law. [Identification of item], in the Charles Anderson Farrell Photographic Collection (P0024), North Carolina Collection Photographic Archives, The Wilson Library, University of North Carolina at Chapel Hill. Received from Roger H. Farrell of Ithaca, N.Y., in June 1986. University of North Carolina Press Records (#40073), University Archives, University of North Carolina at Chapel Hill. Charles Anderson Farrell Papers, 1938-1977 (#4452), Southern Historical Collection, University of North Carolina at Chapel Hill. Charles Anderson Farrell was a native of Yadkin County, N.C. He graduated from Wake Forest College, and after serving in the First World War, he returned there to teach English for a short time. Following his discharge from the army in 1919, Farrell began working for the Eastman Kodak Company in Mexico. Farrell married Anne McKaughan, and they had three children: Charles B. Farrell, Peter S. Farrell, and Roger H. Farrell. In 1923, Farrell moved to Greensboro where he became the first professional photographer for the Greensboro Daily News. In the 1920s and 1930s, Farrell also operated a photography studio, camera store, and art supply house in downtown Greensboro. Highlights of Farrell's career included taking some of the first aerial photographs of North Carolina; taking exclusive aerial photographs of Reynolda House in Winston-Salem, N.C., following the fatal shooting of the heir to the Reynolds tobacco fortune Z. Smith Reynolds; and taking the pictures for Stella Gentry Sharpe's Tobe (1939), a portrait of a young African American boy and his family in the 1930s. Farrell died at the age of 83 in the Friends Home at Greensboro, N.C., in 1977. The collection includes 688 photographic images (negatives and prints) related to three works published by University of North Carolina Press, which Farrell worked on as a photographer. They include Stella Gentry Sharpe's Tobe (1939), Bernice Kelly Harris's "Dramatis Personae: Photographic Studies: Eastern Carolina Folk Plays" (1940), and Aubrey Lee Brook's Walter Clark: Fighting Judge,(1944). 2. Folk Plays of Eastern Carolina, 1939-1940. 3. Walter Clark: Fighting Judge, 1943-1944. Expand/collapse Series 1. Tobe, 1938-1943, 1977. For the Tobe assignment, Farrell assembled a composite family from African Americans living in the Goshes community (the Garner family) south of Greensboro and possibly from within the city itself (the Goins family). The photographs show children and adults in a rural agrarian setting. The primary portion of this series comprises 222 black-and-white negatives Farrell made to illustrate Tobe, which includes all 61 of the images that appear in the book and an additional 161 alternative negatives. Eleven negative envelopes from Farrell's The Art Shop with minimal annotations and a Kensington Film Book with a partially completed index page have been retained. All of the negatives used for the book and a few additional negatives have corresponding interpositives and duplicate negatives made by the Photographic Archives as preservation copies. There are 64 (5x7) reference prints made from the 61 negatives used in Tobe. The photographs are printed close to full frame, permitting researchers to see how the photographer composed the scene prior to cropping by the editor. In the reference print made from the negative for the chapter "Tomatoes for Winter," one can see the image without the additional retouching that added tomatoes to the plants and bushels as seen in the book. The single 2 1/4x3 1/4 negative may have been made by the book's author, Stella Gentry Sharpe, who initially submitted her own photographs for the project. Deemed unsatisfactory, UNC Press hired Farrell to make the images. The image appears in the chapter "Halloween Fun." Also included are a set of 29 negatives. The series also includes an order envelope from The Art Shop labeled "Tobe's Cousins" and, in different handwriting in red ink, "apparently this proposed book was never published." The film pack negatives are individual portraits of a young girl and boy; the 35mm negatives are group portraits and farming scenes. Arrangement: Mirrors order in publication. Photographs created by Charles Farrell, 1938-1939, for Stella Gentry Sharpe's book Tobe. Images are identified using captions from the publication and include the page on which they appear. Note that many of the images in the publication were altered/edited. These images are the original unaltered negatives. Image appears in Tobe on page 1. Duplicate negative has been made. Image appears in Tobe on page 3. Image appears in Tobe on page 5. Image appears in Tobe on page 7. Image appears in Tobe on page 9. Image appears in Tobe on page 11. Image appears in Tobe on page 13. Image appears in Tobe on page 15. Image appears in Tobe on page 17. Image appears in Tobe on page 19. Image appears in Tobe on page 21. Image appears in Tobe on page 23. Image appears in Tobe on page 25. Image appears in Tobe on page 27. Image appears in Tobe on page 28. Image appears in Tobe on page 31. Image appears in Tobe on page 33. Image appears in Tobe on page 35. Image appears in Tobe on page 37. Image appears in Tobe on page 38. Image appears in Tobe on page 41. Image appears in Tobe on page 43. Image appears in Tobe on page 44. Image appears in Tobe on page 47. Image appears in Tobe on page 49. Image appears in Tobe on page 51. Image appears in Tobe on page 52. Image appears in Tobe on page 55. Image appears in Tobe on page 57. Image appears in Tobe on page 59. Image appears in Tobe on page 61. Image appears in Tobe on page 63. Image appears in Tobe on page 65. Image appears in Tobe on page 67. Image appears in Tobe on page 69. Image appears in Tobe on page 71. Image appears in Tobe on page 73. Image appears in Tobe on page 74. Image appears in Tobe on page 76. Image appears in Tobe on page 79. Image appears in Tobe on page 81. Image appears in Tobe on page 82. Image appears in Tobe on page 85. Image appears in Tobe on page 86. Image appears in Tobe on page 89. Image appears in Tobe on page 91. Image appears in Tobe on page 93. Image appears in Tobe on page 95. Image appears in Tobe on page 96. Image appears in Tobe on page 98. Image appears in Tobe on page 101. Image appears in Tobe on page 103. Image appears in Tobe on page 104. Image appears in Tobe on page 106. Image appears in Tobe on page 109. Image appears in Tobe on page 111. Image appears in Tobe on page 113. Image appears in Tobe on page 115. Image appears in Tobe on page 116. Image appears in Tobe on page 119. Image appears in Tobe on page 121. Photographs created by Charles Farrell, 1938-1939, for Stella Gentry Sharpe's book Tobe. These images were not included in Tobe, but have been identified using subjects and topics from subseries 1.1. Photographs created by Charles Farrell, 1938-1939, for Stella Gentry Sharpe's book Tobe. Photographic prints made from original negatives published in Tobe. Copies of correspondence related to publishing Tobe and original enclosures for the negatives in subseries 1.1. The original manuscript materials are in the Charles Anderson Farrell Papers, 1938-1977 (SHC-#4452) and University of North Carolina Press Records (UA-#40073). Expand/collapse Series 2. Folk Plays of Eastern Carolina, 1939-1940. This series comprises 103 negatives and 34 photographs related to Folk Plays of Eastern Carolina. Several of the negatives have corresponding interpositives and duplicate negatives made by the Photographic Archives as preservation copies. There are 25 photographs that were likely made contemporarily to the negatives. The Photographic Archives made 9 (5x7) reference prints from the original negatives. A section of Folk Plays of Eastern Carolina entitled "Dramatis Personae: Photographic Studies by Charles Farrell" is composed of 16 images that illustrate characters and scenes from the plays. Negatives for 12 of these photographs are extant, only 11 of which have corresponding small photographs. There are, conversely, 14 small photographs made from negatives that do not appear in the book. Photographs created by Charles Farrell, 1939-1940, for Bernice Kelly Harris's Folk Plays of Eastern Carolina. Images are identified using captions from the publication and include the page on which they appear. Photographs created by Charles Farrell, 1939-1940, for Bernice Kelly Harris's Folk Plays of Eastern Carolina. Photographic prints made from original negatives published in Folk Plays of Eastern Carolina. Annotated pages from, copies of correspondence related to the publishing of, and original enclosures for negatives from the publication of Folk Plays of Eastern Carolina. Expand/collapse Series 3. Walter Clark: Fighting Judge, 1943-1944. Items in this series consist of 56 negatives and 1 (5x7) reference print. The print, made from the original negative, is of slave cabins and is nearly identical to the view depicted in the book. Farrell used the latter format to photograph African American subjects and the bronze buck statue at Albin. Images mainly depict views of fields, river views, barns, cattle, and slave cabins at Ventosa; 2 negatives are exterior views of Clark's law office in Halifax. Several of the negatives have corresponding interpositives and duplicate negatives made by the Photographic Archives as preservation copies. This series contains 9 of the 10 negatives used for the book, one of which is a panoramic view made from 2 negatives of fields at Ventosa, Clark's ancestral home on a large plantation along the Roanoke River in Halifax County (Northern forces burned Ventosa during the Civil War). Other images include a bronze buck statue at Albin, the colonial mansion built in the early 1800s on the Clark family estate at Scotland Neck; a dike along the Roanoke River, two descendants of slaves, and a section of the slave quarters at Ventosa; a tester bed once used at Ventosa; and Walter Clark's law office building in Halifax. Only the negative of the tester bed is lacking. Photographs created by Charles Farrell, 1939-1940, for Aubrey Lee Brook's Walter Clark: Fighting Judge and are identified by the caption assigned in the publication and (when applicable) include the page on which they appear. Image appears in Walter Clark: Fighting Judge following page 30 (left side). Image appears in Walter Clark: Fighting Judge following page 30 (right side). Image appears in Walter Clark: Fighting Judge facing page 31. Image appears in Walter Clark: Fighting Judge facing page 54. Image appears in Walter Clark: Fighting Judge facing page 55. Image appears in Walter Clark: Fighting Judge facing page 182. Photographs created by Charles Farrell, 1939-1940, for Aubrey Lee Brook's Walter Clark: Fighting Judge. These images were not included in Walter Clark: Fighting Judge, but have been identified using subjects and topics from subseries 3.1. Photographs created by Charles Farrell, 1939-1940, for Aubrey Lee Brook's Walter Clark: Fighting Judge. Photographic prints made from original negatives published in Walter Clark: Fighting Judge. Annotated pages from Walter Clark: Fighting Judge.